"You are amazing. 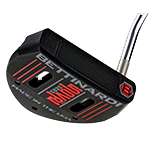 The Bettinardi Inovai Counterbalanced Putter took all of the jerky motion out of my stroke! The added 2.0 SuperStroke Grip and the proper counterbalance weight made an awesome feeling putter even better! Shot 1 over in my 9 hole mens league tonight to win $140!! No three putts. Couple of nice putts to save par. Amazing how much better you can play when you are not afraid to be on the green. Thank you!"